The audience tape for Led Zeppelin’s June 25th, 1972 Los Angeles show first began life on vinyl on the simply titled LA ’72 (TT02) and received wider circulation as A Night At The Heartbreak Hotel (Artemis). Both of these titles are very good quality but incomplete. Silver Rarities released one of the earliest compact disc versions of the complete show on Burn Like A Candle under their unique Smoking Pig label, a title which has pretty much stuck with this tape ever since. Tarantura released the four-disc set Route 66 (T4CD-3) that contained an incomplete copy of this tape coupled with the San Bernardino show. Route 66 has only “Rock And Roll” from the long encore section. This was copied on Silently Ravaging America (WLL016/017) on the Whole Lotta Live label. Missing Link tried to revive the early vinyl title with Night At The Heartbreak Hotel (ML-011/12/13) which was a copy of the Silver Rarities including the spurious encore “Weekend” and Cobra released the three disc set LA Forum (Cobra Standard Vol.024) about this time. Equinox released the three disc set Burn That Candle (EX-00-010/011/012) which omits the encore and includes the Wolfman Jack interview from the following night. Empress Valley followed that with Burn Like A Candle in three editions. The first was had LP sized packaging with three discs, followed by a gatefold sleeve edition with a fourth disc containing the Long Beach soundboard fragment which was followed by a third edition released in a jewel case. Finally Wendy released Burn Like A Candle (WECD-63/64/65) last year. Just like Smoking Pig and the Empress Valleys, Wendy too uses the William Stout artwork of the burning candle on the front. Tarantura is the latest label to issue this tape on Burn Like A Candle. This is a gorgeously packaged box set where the show is spread out over four discs and includes a bonus disc. The four discs are housed in a gatefold sleeve which fit nicely in the box with the bonus disc in a single sleeve which comes in different colors depending upon he number you receive (#1-50 are white, #51-100 black, #101-150 cream, #151-200 yellow, and #201-300 green, and we are all encouraged to collect them all if we can). The tape is a very good to excellent stereo audience recording taped very close to the stage with wonderful dynamics capturing the warmth of the performance beautifully. There is distortion during very loud parts but nothing to detract from the enjoyment of the show. Tarantura use only the older source and do not use the newer source that surfaced recently. Cuts at 1:30 in “Going To California” and at 17:53 in “Whole Lotta Love” are still present. They also include “Weekend” as an eighth encore although it is now generally conceded to be from the June 14th Nassau Coliseum tape. The bonus disc contains the Wolfgang Jack radio interview with Robert Plant the night after the show which first surfaced on the Graf Zeppelin interview compilation which is followed by the short, five minute rehearsal from a gig in Southampton, England the following January. The reason for its inclusion in this set is not apparent since it has nothing to do with neither the Los Angeles concert nor the famous rehearsal tape that is sometimes attributed to this date. Compared to older releases this is not a major upgrade but it does rank among the better sounding versions of the tape with a more natural timbre. Tarantura spread the show over four discs when it fits on three. Nevertheless this is great sounding and is a good, high quality deluxe production of a concert that is essential to own. Much of this was released officially on How The West Was Won, but it is good to hear the songs unedited and Robert Plant’s speeches on stage which gives this show its characteristic warmth. The set is nothing less than a great summary of the first five years of Led Zeppelin’s recording career. This show is notable also for having perhaps the longest encore section ever performed by the group containing their cover of “Louie Louie” including very rare Jimmy Page vocals. John Paul Jones plays Sly And The Family Stone’s “Everyday People” on the organ as a prelude to an epic version of “Thank You”. It is also enjoyable having the Wolfman Jack radio show as a bonus since it contains a rare glimpse of Plant on the radio giving an immediate reaction to one of Zeppelin’s legendary gigs. Burn Like A Candle is another limited edition set released by the Tarantura label who is focusing upon releasing tapes from the lowest generations possible releasing the definitive edition of well-known tapes. Note on the final encore “Weekend”: Many years ago the track “Weekend” was considered a legitimate encore for this show. The reason why it is in much more poor quality from the rest is because the taper was leaving the venue and didn’t know they were going to come back for more. This song was thus taped at the back of the venue. My claim above about “Weekend” being from the June 14th, 1972 Nassau Coliseum show has been a common assumption for many years and is the reason why the latter day releases of this tape by Empress Valley, Equinox and Genuine Masters omitted the track. For this release Tarantura received a fourth generation copy of the tape which includes “Weekend”. Comparing “Weekend” on the Tarantura with the version on Missing Link reveals that it is more clear and several seconds longer and Plant can be heard speaking at the song’s conclusion, saying what is assumed to be “good night”. Comparing the Tarantura with the most recent release of the New York tape on Whole Lotta Led demonstrates that the common assumption is correct. The performances between the two are identical. Plant says something like “vocal” before the band start the song and the greetings at the end sound the same. Plus the performance sounds the same too with Plant singing the first three verses of the song before Page plays his solo. Plant returns to sing the final two lines of the song (“No harm done, just a-havin’ some fun on a weekend / That was all, we had a big ball on the weekend”) before singing the first two verses again. Also Plant’s intonation for the policeman’s line (“The police with a flashlight bright & nosy / Sayin’, ‘Holdin’ neck o’er there, what is all this?’”) is the same. 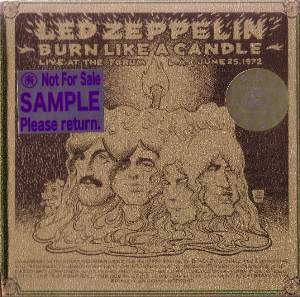 Zeppelin may very well have played “Weekend” as a final encore that night in Los Angeles, but since there are no cuts surrounding the track on the New York tape it is safe to assume that the recording on these releases is not from Los Angeles and may have been imported early in the tape’s history for completeness.